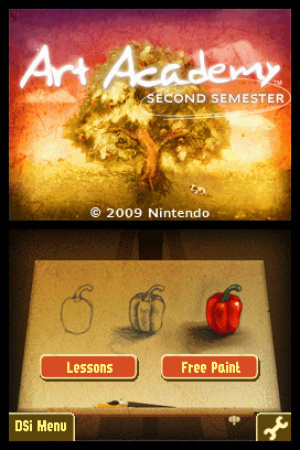 Two weeks ago, Nintendo released Art Academy: First Semester. We reviewed it and were happy to do so. The title was impressively functional, easy to use and very much successful at fostering creativity. These are all good things. We were painting apples and red peppers like there was no tomorrow. The sun was shining. We were merry. 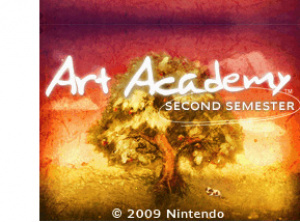 This week, Nintendo released Art Academy: Second Semester. And while everything positive that we had to say about the first release is still present and accounted for, our enjoyment and appreciation is severely tainted by the fact that we're being asked to drop another 800 points on it all over again with no additional features or functionality. Considering nothing about the title's mechanics or limitations have changed since First Semester, it's strongly suggested that you read that review in addition to this one. The trouble isn't that Second Semester isn't worth buying; the trouble is that we already bought it and are asked to buy it again. There are two main sections to this release, as before: Free Paint and Lessons. Free Paint, as you learned two weeks ago, is what will give Art Academy longevity beyond the few hours you'll spend learning about tools and techniques from built-in art instructor Vince. It's been plopped wholesale into Second Semester, without any alterations whatsoever. Lessons here number a measly four...a notable step back from the six found in the previous installment, for the same price. Mini-lessons are also included but, again, they are not much value as they involve painting included pictures without guidance. If you want to paint pictures without guidance, you can import any picture you like and go bananas. Mini-lessons can't really be considered to be features, unless you consider the photo of somebody else with their dog that comes with a picture frame a "feature." It's difficult to justify Second Semester as a separate release in itself. The only enduring feature is one that its target audience already owns if they downloaded First Semester. And if they didn't download First Semester, newcomers will find no instructions on how to use the tools. This lack of any explanation of how the program works indicates that Nintendo, for some reason, really does expect people to download both releases. In that case, why include Free Paint here at all? Why not just charge 200 points for the new lessons? Why inflate the price by including major features that they assume we have already? Or why not offer a complete, single release for (a much more fair) 1000 points instead? It's a real shame that Art Academy comes off as so greedy. This is an excellent idea with brilliant execution. (The programmers truly deserve their accolades, as we never cease to be impressed by how accurately the tools handle and react to what we do.) There's no excuse for this full-priced sprinkle of new lessons, and that casts an unfortunate dark shadow over this colorful release. Downloading First Semester comes recommended by us at Nintendo Life; doubling the cost for a meager four lessons more does not. It may be a worthwhile purchase for those who skipped First Semester, but bear in mind that this release assumes you already know how to use the tools and interface, so...good luck with that. Bummer, this is a real ripoff. It makes me glad I didn't download the first one. I don't want to support offerings like this second one, no matter how good the first one is. If they lower the price later on, then maybe I'll think about it. I'd like to hear some specifics about the new lessons, as that's the crucial part, not merely their number. What do they teach? Is it significantly more advanced than what you learn in the first? 800 seems steep from one angle... I guess if you think about the cost of decent art lessons in the real world, where you could easily pay $20 for a single lesson, it's a little more reasonable... if, that is, the lessons are as helpful as an hour with a live teacher. I'm really dissappionted. I am enjoying First Semester but I assumed that this would have at least six or more lessons, but less that's shocking. Honestly this is a great program but it should be made more affordable, so more people will try it. I think Nintendo was in the mood to overprice everything this past monday. I'm still hoping they eventually release all the lessons on a cart. I would've given it a 1/10. It's just pathetic that Nintendo would make this kind of money grab. I'm more and more tempted to get an Ipod touch or PSP because their online systems are SO much better, it's like night and some super nova day....I actually hate Nintendo when it comes to online content. I don't see how a development studio makes these decisions before releasing an app like this. Don't they realize it's gonna get a 4/10? The strength of most "episodic games" is that they build on the previous entries but don't require it (I feel compelled to mention the Strongbad series on WiiWare) Offering this as a 5-dollar DLC addition to the first would've been a much more intelligent idea, unless they think there may be a market that will by this one without having already bought the first. Like warioswoods, I would also appreciate hearing more about what the lessons actually involve. What concepts are taught? How long does each lesson take? How are you graded or judged when completing the lesson? As someone with no formal art training, the value of this application for me would be based on the knowledge it imparts instead of the tools it offers. If the lessons are educational and entertaining then $8 might be acceptable. 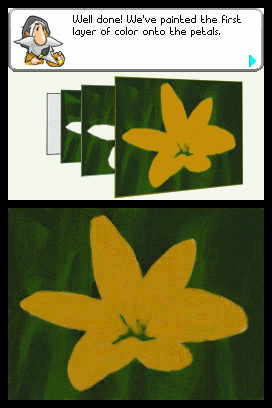 The concepts are simple ones; each lesson, essentially, is a guided recreation of a picture. Your instructor takes a step, you watch, and then you do what he did. Typically you'll be pencilling in the basic shape the painting will take and applying the colors later, but there are exceptions. You're more "introduced" to concepts than you are "taught" them, as you're always within the confines of a single-instance usage. Lessons vary in terms of time. A good average for me was one hour per lesson, though it's important to realize that everybody is going to work at his or her own pace. You are not graded or judged when you complete the lesson. You don't even need to complete the lesson...you can do whatever nutjob thing you want to do and Vince won't know any different. 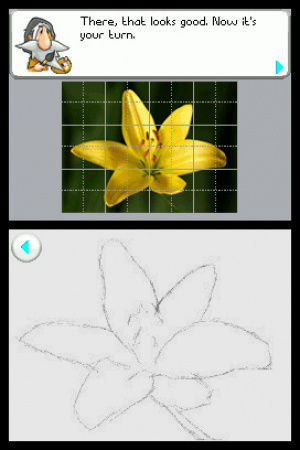 Art Academy seems like more of a springboard to artistic interest than a springboard to artistic ability. You learn how various techniques come together to create a work of art, but at no point will you actually feel in command of those techniques. It works well as a fun way to decide whether or not you're interested in taking ACTUAL art lessons, with a good teacher who can answer your questions and respond to what you're doing personally. This second release seems greedy because it doesn't bring you any nearer to artistic competance...it's just another few (very few) lessons of the same type you've bought already. I had a feeling this wouldn't get too high a score. Real shame. From what it sounds like (I know it's been said), this one would've been better if they'd just released it as DLC and not a separate, fully (for DSiWare) priced game. Still, can't wait for the games to come to Europe. My brother's into Art so it would be a good gift. Thank you very for the in-depth comments -- they answer my questions perfectly! Good review. A shame Nintendo did this especially since I love the First app. DLC would've been better or including it all in one, as you outlined. Thanks for the information. @ejamer: I second CB's recommendation of getting the first one. I hate when developers take the piss and Nintendo is getting into a bad habit of doing just that more and more often. This should have been a single game imo. If they can I would suggest people just get the homebrew software Colors instead. I sort of thought that this would happen. Big N has a serious problem with trying to ripoff DSiWare users by reselling or overpricing their products. What is next, selling Super Mario Bros in 8 episodic installments for 500 points a piece? Nintendo must have some serious major league idiots or... they are just insanely enjoing fooling us arround. Stop supporting their products and tgey should think twice before releasing crap software.Nintendo`s greed is beyond measure - now you have no excuse to think otherwise. Another fact is the pricing,obviously.If they release more semesters,800 pts each,it will cost you similar to a full game...except it is dissected and you dont own the "hard copy".I expected as much.Nintendo just reconfirmed my boycoting (since this summer,till next year) of tgeir dsiware products.it makes even more sense now and doesnt make me feel sorry i dont download other better tittles.When will the actual digital distribution begin,anyway?? i cant ressist saying this: F..k YOU Nintendo! what a kick in the balls are such products for those who bought it. The thing that really irritates me, is that this game leaves newcomers in the dark. I downloaded First Semester and considered this until I read this review and others that downloaded it. Seriously its as if they expect you to download the same thing twice for $16. I agree that $10-$12 would have been enough not to mention how much more memory both games take up. They so should've made just the lessons 400points and then the whole thing 800 if people really wanted too. I LOVED the first one. Next time I get some Nintendo Points I might get it. I got this and completely enjoyed it. It teaches you how to paint a lily, and swan amongst others. But the price is kind of high(not compared to actual art classes). Hey.... With that screenshot, (the yellow flower painting), don't you learn how to paint that in semester one? Yeah.... I'm not getting this. But I will say, I loved the first game. Huh. In the free paint mode, can you save anything you have done to an SD card? The only reason why I would get this is because of being able to draw "on the go" (like waiting during an appointment)...thanks. Being an artist , this has my interest both first and second symesters however I do wish as one of the other comments mentioned this was 500 or less apiece...rather then 800 each seems to me a bit much! Which lessons does 2nd Semester come with? I purchased it on an old dsi but can't remember as I don't have a legally downloadable copy anymore (on my 3ds.) Anyone care to remind us what lessons are included?